White Storks are around 80-100cm long and have a wingspan of 200-220cm. Apart from their black pinion feathers and their reddish beak and legs, they are pure white. White Storks weigh between 2.5 and 4.5 Kg. 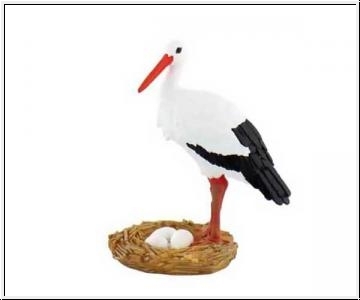 Since the Stork doesn´t have a particularly strong voice, it communicates by clapping with its beak (in some languages, such as German, it is even known as the Clapping Stork!). Storks clap to greet their partner as they return to the nest, as well as to defend against competitors for the nest. They also make elaborate clapping sounds as part of their courtship ritual.